Voice of the Collector: Is it Worth It? 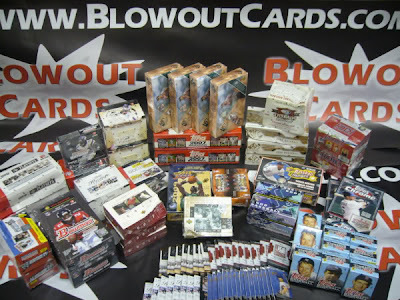 Blowout Cards currently has an eBay listing for a lot of damaged boxes. With 2 days left the bidding is up to over $1,000. You get 36 boxes and about 40 packs. My question to you . . . is it worth it? Like you posted a while back, randomly busting wax is a loosing game for most, and even a mint condition wax lot is a loosing proposition for a collector like myself. Busting a bunch of discount, damaged wax? NO. My guess is that the people bidding this up are dealers looking to throw the undamaged packs into already opened boxes that have already had the "hits" pulled out of them. That's some classic bait-and-switch right there! To answer your question. For me, no. For a dealer who could underhandedly make a mint off of this, YES. I looked at the auction and there honestly isn't much there that entices me. I don;t mind ripping wax, but there's not much there that I can say is "wroth" $1,000-plus. I looked at the auction and there honestly isn't much there that entices me. I don;t mind ripping wax, but there's not much there that I can say is "worth" $1,000-plus. For me, no. Then again I'd never spend $1000 (at once) on cards, so it's hard to say. Even I WAS someone who spent that kind of money this particularly auction wouldn't interest me, but I like the idea of discounts for damaged card boxes! As for busting wax being a "losing" proposition - yeah, it probably is. But it's fun, and isn't that the point? I wouldn't buy anything uber high end, but what's a $20 pack of Sweet Spot once in a while, just for fun? As long as you bust wax in moderation, the thrill of an occasional big hit far outweighs the previous small stuff! Dude, did you copy my post? Stusigipi- No sir. Saw Blowout's Tweetsaw the auctioned and was pretty suprised that it was over a grand already, or at all.